This post is the continuation of a review of James D. Tabor’s Paul and Jesus: How the Apostle Transformed Christianity begun last week in my last post. We won’t remember all the details of the picture as presented by Tabor, of course, but readers can and should retain the main features of both foreground and background. If one doubts but finds the picture plausible, worth considering more seriously, he or she can pursue the many footnotes and works referred to, both supporting and challenging Tabor’s conclusions. I’m confident the author would consider any open re-examination by readers a success for his effort, as would I. And the lighter reader who may have more curiosity than personal “investment” in the subject will find it easy enough to understand what Tabor is saying. And with that, to also grasp the importance of Paul’s new, profound yet speculative and often confusing concepts leading to the kind of Christianity most of us “know” on one level or another, Christian or not. Here is my own summary of his core point in only slightly different words. The concept bears repeating: Paul transformed the beliefs and practices of Jesus and subsequently of his original followers into a new and otherworldly religion that replaced the former Israel-and-earthly-kingdom focused (apocalyptic) sect of Judaism. Tabor reminds us that according to most traditional Christians, from theologians to informed lay people, it was the resurrection of Jesus that transformed the dejected, perhaps nearly hopeless disciples, upon Jesus’ death, into determined, evangelizing and joy-filled people. Something apparently did do that, as the record seems clear that key disciples, including “The Twelve” Apostles (with Judas replaced, and not including Paul) did gain a sizable following for some kind (more on this later) of belief in Jesus and his return to establish the Kingdom of God. This was for about the first 40 years until the destruction of Jerusalem in 70 C.E. After that, as Tabor repeatedly points out, we lose track of the Jerusalem-based early “Christians” (not yet split off as distinct from Judaism). This pivot of history opened the door for the ultimate victory of a Pauline theology and worldview, built upon but largely apart from Judaism. This “victory” was over the original disciples’ and Apostles’ concepts of a Jewish Kingdom of God and Messiah (a human, divinely appointed) with continued Jewish observances toward “righteousness.” Perhaps most centrally, this did not involve a substitutionary atonement for our sin by a uniquely human-divine Jesus. In fact, it is this massively influential event of the Roman-Jewish war of 66-70 which sets the stage for what developed in the writing of probably all, or nearly all of the New Testament (NT) besides seven letters (of 27 total books) definitely written by Paul during the 50s to the early 60s. Tabor astutely and clearly traces how the development of the Gospels apparently went, from just after the war until a few decades later, under heavy Pauline influence much more than influence of the Jerusalem leaders which included James, the brother of Jesus. (Most prominently him, as the clear head, though he is downplayed so much in the NT that his lengthy, key role is almost passed over there, and is even unknown to many lay people today who think of only Peter in those terms, while he was no more than “second in command”). As Tabor illustrates well, Luke’s agenda in Acts is clearly to smooth over the strong theological conflict and high animosity of which Paul speaks, between himself and the Jerusalem leaders. Luke takes pains (often at odds with Paul’s direct testimony, and likely around 40-60 years later) to indicate that actual or potential disagreements on major issues got resolved to everyone’s satisfaction. As such, he presents an apparent “unity of the faith” by the time the historical and theological summary, in story form, just trails off with Paul headed toward Rome as a prisoner in the early to mid 60s. Now, back to the critical resurrection question and how Tabor handles the many puzzles surrounding it in the NT. Since it seems to have been so central for Jesus’ original followers, then for Paul and on down to most present day Christians, how are the contradictions (within the Gospels) and the confusions (between the Gospels and Paul) to be sorted out? Is there any pattern or meaning to them? What does any resolution leave us to understand? As to pattern, Tabor contends that the chronological approach of Paul to Mark to Matthew and Luke (with John likely following last but differing in focus and theology) gives us the keys. The story is too involved to summarize well here. But it is basically this: The disciples do return, disheartened, to Galilee (as omitted fully by Luke). There Peter is probably first (as Paul reports) to have “seen” Jesus, followed soon by others, perhaps in joint visionary experiences. At some point, with faith in the still-coming Messianic Kingdom renewed, and expecting Jesus to very shortly bring it in from God’s throne, these Galileans re-gather in Jerusalem. According to Paul, his vision and all the other appearances of Jesus were of the same nature — visionary. Though Paul refers to Jesus as crucified, buried and raised on the third day, he shows no interest in his tomb being found empty. Tabor relates, from the Gospel texts themselves, how it probably was discovered empty because Joseph, the tomb’s donor, had moved the hastily and temporarily entombed body to its final burial place. Whether or not this vital fact was discovered by the disciples later sometime, as it seems it would have been, is not a crucial point. The Gospel writers wouldn’t include it if it was, decades later while passing along either the existing tradition and/or building their own case for a corporeal resurrection; and Paul was unconcerned with the physical body’s disposition, in his firm belief that Jesus became a “life-giving spirit,” having a “spiritual body,” and using similar phrasing frequently. An additional indication that Paul refers to merely visionary appearances, not a body of “flesh and bones” as in the Gospels, is that he refers to an appearance to “over 500 brethren at once” (1 Cor. 15). Now, in getting so detailed on mainly Paul and the Gospels on the resurrection, I have merely given a sample of the approach of Tabor in Paul and Jesus. He goes into both helpful detail and effective summary in covering Paul’s theology and how it differed so radically from that of the Jerusalem leaders who apparently were distant enough from Paul’s work most of the time that the true differences only came out gradually and were confronted in Paul’s final trip (of three) to Jerusalem. According to Luke, who Tabor calls questionable, at best, as to his historical claims although Luke obviously has consulted sources, this confrontation indirectly leads to Paul’s arrest and transport to Rome. We get no clear sense of how the examination of Paul there actually turned out. However, as Tabor develops at some length, Paul’s later writings show clear disdain for and opposition to alleged apostles who he believes (as do I) are the Jerusalem leaders and their representatives (“apostle” is a fairly broad term not always referring to “The Twelve” and/or Paul). Have you read the book? Do you intend to? Please share your thoughts whether you have or not, intend to or not! Thanks again for your work in “Paul and Jesus” and your long dedication to the subject, James. And I appreciate the link to the review, very much… BIG boost in visits to my blog! I hope the book continues to get broad readership, as it deserves… both for its superb quality and for the importance of the subject matter! I have read the book as well as HOW JESUS BECAME CHRISTIAN by Barrie Wilson. Dr. Wilson’s study I believe has led him to convert to Judaism. My most recent study has taken me to Gerhard Lohfink’s book JESUS OF NAZARETH (What he wanted, who he was). On page 127 he writes: “In everything he (Jesus) did–and above all in his symbolic actions–Jesus was creating the beginning of the eschatological Israel.”. Thanks for the comment, David. I really enjoyed Wilson’s book also. He is one of several key scholars who also write well for the public and who are effectively presenting the same or related issues that Tabor does in “Paul and Jesus”. It IS fascinating how numerous Jewish scholars enjoy specializing in early Christianity and how many Christian scholars also find, as apparently Wilson has, a profound interest in and respect for what may be the predominant ethos and manner (style, perspective, etc.) of Judaism. For most Christians it is surprising to realize (IF they accept it) that Judaism and Christianity overlapped significantly for not just a couple or 3 decades but for 2-3 CENTURIES. If both are rightly seen in historical and theological perspective, it shouldn’t BE surprising. The divergence led by Paul that Tabor so well traces was just the beginning of an overall Christian trend of development that took a long time to become predominant and then basically irreversible. I’ve not read Lohfink’s book, but will look for an opportunity to. The statement you quote is indeed a provocative one, and I’m curious just what he means by it. Thanks again! Howard — First-rate review! Here’s mine (not as good as yours, but shorter). I have been a longtime admirer of Dr. Tabor, but nothing prepared me for Paul and Jesus, not even his other famous book, The Jesus Dynasty, or his mesmerizing lectures at SBL and BAR. Everything he proposes here about the self-appointed apostle makes perfect sense. It clarifies what must have happened many decades before the New Testament was ever written, including an unfortunate after-the-fact reshaping of Jesus and his Jewish faith. 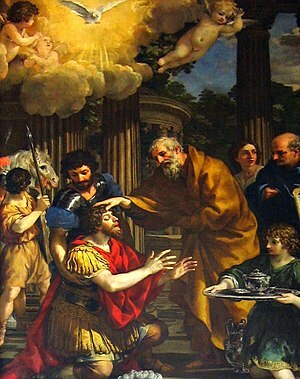 Paul’s wishful thinking, manifested as visions and apparitions, supported by theological admonitions and letters, half of which may have been forged, set the stage for later Gospel accounts whereby human sacrifice became the Pauline prerequisite to human salvation. Throw in Emperor Constantine, the help of Roman officials, plus sympathetic church apologists, and the transformation from Judaism to Christianity is complete. I honestly believe Tabor’s presentation rivals Schweitzer’s, if for no other reason than it unravels something inherently complicated while making the story understandable to non-scholars, whether or not they happen to be religious. Not even Hemingway could have handled the subject so artfully and so Spartan-like. The historic victory may be Saint Paul’s, but the literary triumph goes to James Tabor. I appreciate the “thumbs up” on MY “thumbs up”! I’d like to see your review which I presume you intended to have a link to in your comment… or did you just mean it was upcoming in the following paragraph’s? If you meant for a link, I don’t think WordPress stripped it out. At any rate, if you have one, feel free to include it and that doesn’t work, I can set up one for you. As to Schweitzer, I presume you mean his book on Paul? I’ve not read that one but have it on my short list to get to. I don’t know if you noticed that about a month or 2 ago, I reviewed Schweitzer’s book “The Kingdom of God and Primitive Christianity”, in which Paul gets a chapter. I think that book was probably more influential, at least directly to most readers, than was his more famous “The Quest of the Historical Jesus”. (“The Quest…” perhaps more so indirectly.) But I don’t know how widely the later book was read, nor his book on Paul. Jim Wallis’ latest book, On God’s Side, indirectly devotes much attention to the theological divergence between Paul and Jesus. The focus on personal salvation as the primary message and meaning of Christ is antithetical to Jesus’ overwhelming focus on building the Kingdom of God on Earth — based on love of neighbor, love of enemy, and above all, love of the outcast, the oppressed and the poor. Norlyn, thanks for the ref. to Wallis’ book. I’ve not read it, nor much else he’s written other than “Sojourners” articles years ago, altho I’m fairly familiar with his work and respect his approach and his priorities. Incidentally, you may well have also read some of Brian McLaren’s work. I have, and also heard him in person on 2 occasions, one an all-day seminar. Their work probably has a lot of overlap. McLaren is almost a category of one, from my perspective… still claims the label “Evangelical” but it seems how he defines that must be quite different than either the typical outsider OR insider definition. If he’s not officially “Integral” then he must be pretty close to it. I think his analysis of the Paul-Jesus differences may be close to those of Wallis, again without having interacted much with Wallis’ thinking of late. But they are the kind of relatively “traditional” yet fresh-and-independent-thinking Christians who I see as helping younger Christians move ahead in their spiritual development and seeing scriptural truths at a deeper level… well above literalism and the tight “systematic” theology that is tied to that general approach. To me, the Integral system of understanding the stages and the multiple aspects of either an individual’s or an institution’s or culture’s development accounts for what is going on with us all better than any other system. And the Process Theology model, which fits with it well, helps further explain how the Bible and the phenomenon of Jesus AND “the Christ” has become so powerful a molding force, one with loads of positive potential that emerges only as people move up the developmental scale, so to speak.